Penalties for a violation may include hunting or trapping privilege revocation for one year to life and forfeiture of firearms. A person found guilty of a violation a second time within three years of a previous conviction shall have their hunting or trapping privilege revoked by the court trying the case. Hunt or kill any wild bird or wild animal, including any nuisance species, with a gun, firearm, or other weapon, or to hunt or kill any deer or bear with a gun, firearm, or other weapon with the aid or assistance of dogs, on Sundays. See Sunday Hunting on General Hunting Information for exceptions. Hunt migratory game birds with a shotgun capable of holding more than three shells in the magazine and chamber, combined, unless allowed by federal regulations and authorized by the Department. Hold in captivity any live wild birds or wild animals outside the limits allowed by regulations without a permit. Discharge a firearm, arrowgun, or archery tackle in or across or within the right-of-way of any public road. Cast a light attached to a vehicle or from a vehicle beyond a roadway upon places used by deer without written permission of the landowner or at anytime while in the possession of a rifle, shotgun, pistol, arrowgun, archery tackle, or speargun. Handle any firearm in a reckless manner so as to endanger the life, limb, or property of any person. Destroy, mutilate, or take down “posted” signs or litter. Take or attempt to take wild animals and wild birds with the exception of bobcats, coyotes, crows, foxes, and raccoons by the use or aid of recorded animal or bird calls or sounds or recorded or electrically amplified imitation of animals or bird calls or sounds; provided, that electronic calls may be used on private lands for hunting bobcats, coyotes, raccoons, and foxes with written permission of the landowner and on public lands except where specifically prohibited. Hunt adjacent to forest fires. 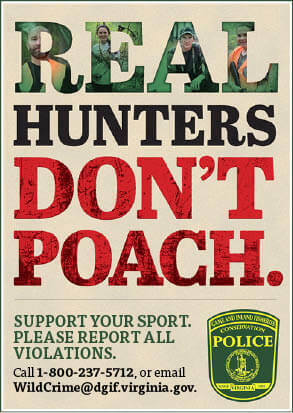 Willfully and intentionally impede the lawful hunting or trapping of wild birds or wild animals. Kill or cripple and knowingly allow any nonmigratory game bird or game animal to be wasted without making a reasonable effort to retrieve the animal and retain it in possession. Hunt under age 12 without being accompanied and directly supervised by a licensed parent, guardian, or other adult designated by the parent or guardian. The term “accompanied and directly supervised” means the adult maintains close visual and verbal contact, provides adequate direction to, and can immediately assume control of the firearm. Hunt with an Apprentice Hunting License prior to completing hunter education unless accompanied and directly supervised by an adult over the age of 18 who has, on his person, a valid Virginia hunting license. See “Hunter Education Requirements” on Hunter Education for further explanation. Shoot a rifle or pistol at wild birds or animals on or over the public inland waters of the state. However, licensed trappers may shoot a .22 caliber rimfire rifle or pistol on or over public inland waters for the purpose of dispatching trapped animals. Carry a loaded rifle or pistol on a boat or other floating device on public inland waters for hunting wild birds or animals. Shoot waterfowl or migratory game birds from a boat being propelled by a motor. Hunt while under the influence of intoxicants or narcotic drugs. Molest nest, eggs, den, or young of any wild bird or animal, except nuisance species, at any time without a permit as required by law. Shoot or attempt to take any wild bird or animal from any vehicle, except as otherwise provided by law. Exceed the bag limit or possess over the daily limit of any wild bird or animal while in the forests, fields, or waters of this state. Use vehicles or possess firearms (including concealed weapons) while retrieving dogs on private lands without permission of the landowner. Use live birds or animals to decoy or call game. Kill or attempt to kill any deer while in a boat or other type of watercraft. Hunt or attempt to kill or trap any species of wild bird or wild animal after having obtained the daily bag or season limit during such day or season. How­ever, any properly licensed person, or a person exempt from having to obtain a license, who has obtained such daily bag or season limit while hunting may assist others who are hunting game by calling game, retrieving game, handling dogs, or conducting drives if the weapon in possession is an unloaded firearm, unloaded arrowgun, a bow without a nocked arrow, or an unloaded crossbow. Any properly licensed person, or person exempt from having to obtain a license, who has obtained such season limit prior to commencement of the hunt may assist others who are hunting game by calling game, retrieving game, handling dogs, or conducting drives, provided he does not have a firearm, bow, or crossbow, or arrowgun in his possession. Alter, change, borrow, or lend a hunting license or permit. Hunt with explosive head arrows or arrows to which any drug, chemical, or toxic substance has been added. Possess or transport any wild bird or wild animal or the carcass or the parts thereof, unless specifically allowed and only in accordance with regulations. Hunt wild birds and wild animals with fully automatic firearms, (i.e., machine guns). Sell or purchase any wild bird or wild animal carcass or parts thereof, except as specifically permitted by law. Use radio tracking equipment, except on dogs or on raptors permitted by a falconry permit, to aid in the chase, harvest or capture of wildlife. To possess or use deer scents or lures that contain natural deer urine or other bodily fluids while taking, attempting to take, attracting, or scouting wildlife in Virginia. Q: Is it legal to kill snakes in Virginia? A: No, under normal circumstances. Snakes can only be killed when their presence represents an immediate human health hazard or they are creating some other type of nuisance issue. State or federally protected species (e.g. canebrake rattlesnake) may never be killed under any circumstance. The indiscriminate killing of snakes is contrary to the Department’s conservation ethic. Not only is it illegal to hunt, chase with dogs, or attempt to kill game birds and animals from a baited site, it is also illegal to feed some wildlife under certain circumstances. The Department does not encourage the feeding of wildlife at any time of the year. Feeding restrictions help control the transmission of diseases, nuisance problems, littering concerns, and enforcement issues about hunting with bait. It is unlawful to place or direct the placement of, deposit, distribute, or scatter food or salt capable of attracting or being eaten by bear, deer, or turkey year round on National Forest and Department-owned lands. Cities and towns have the authority to prohibit the feeding of deer by local ordinance. Contact localities for details. Upon notification by Department personnel, if anyone continues with any of these activities for any purpose and it results in the presence of species mentioned previously in this box, such person shall be in violation of the law and subject to a fine of up to $500. No part of this regulation shall be construed to restrict bonafide agronomic plantings (including wildlife food plots) or distribution of food to livestock.